A change- not a brother or sister of the Death Watch, but a family of Freeguild. This is the chronicle of their most ancient history- in time, they will reappear in other stories. Long ago- before the Gates of Heaven were shut, before the Gods were disunited, before the taint of Chaos reappeared in the world, deep in the Age of Myth when the world still lay verdant and untrampled, there were two men. One, Lars of the Duns, was a refugee from far Arcadia, fleeing political violence in that ancient land. He led hundreds of his followers with him to a new home in the forest, under the flag of the sturdy steeds that had taken them thus far. There, he founded a new realm- the Empire of the Green Horse, whose kings traveled from one steading to another carrying their court with them. For many centuries they flourished, creating art and architecture both primitive and beautiful. They were the Green Kings, and under their tutelage the hills bloomed and flourished, and the valleys prospered and grew verdant. But they came to an end, as all things must. 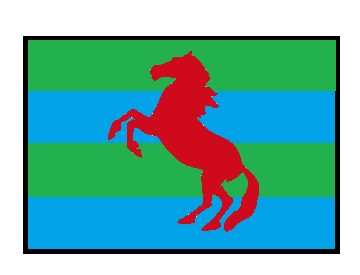 No one is quite sure of what brought the Kingdom of the Green Horse to its finish. Stories are told of wandering Gargants, Orruk invasions, pacts with malevolent sorcerers, or a waking dragon living under the hills. Only the Knights of the Last Flower, who claim descent from that land, can say for sure, and they keep that knowledge locked away for reasons fathomable only to them. When the kingdom fell, though, the survivors fled away from those hills, leaving them to become wildlands and impenetrable forests. The refugees reached a land between two rivers instead- there, they met the descendants of the second man. Not so far away, in the marshes and wetlands that dot and snake through that land, Connor Marsh made his home. A fisherman, an explorer and a hunter, he plied his trade across the waters, spreading his nets and feeding his family and friends off their bounty. As his reach expanded, he led them to drive out the grots, troggoths and waking dead that also claimed that land. Sometimes, he would make war on other families and villages as well. More often, he would trade and ally, marrying his daughters to their sons and his sons to their daughters. By this, he became not only patriarch but lord, chief over a growing sphere of influence stretching across not just the marshes but the twin rivers that formed their borders. In time, his family and his domain would be named after the greater of these two rivers. They would become known as the Reiks. The first meeting between the people of the rivers and the survivors of the Green Horse was not salubrious. The refugees foraged on lands long claimed by the Reiks, and when confronted refused to bow before the local powers. Again and again, the Reiks would confront the newcomers, and soon blood was shed throughout the region. The locals had the ground and their boats, but the men and women of the Green Horse brought weapons of bronze, and their steeds besides. As the battle between the two grew more pitched, one man- Gunter Worlitzer- emerged as leader among the survivors, pushing deeper and deeper into Reik territory as the seasons turned. It was only with their backs to the river that gave them their name that the defenders were able to make a firm stand against his army, using a blend of what they knew and what they had learned throughout the long years of subjugation. Over the centuries, successive generations of Reiks and Worlitzers would cycle between bitter, wary truce and total war. Many were the times that the twin rivers ran red with the blood spilled by their shores. Only rarely were the two families- the two peoples- willing to set aside their hatreds of one another, when both were threatened by a greater outside enemy. The greatest of such incidents came with the advent of Warboss Goomba da Bonecrusha, known as the Mad Dok and whispered by some to be Boss of Bosses. He led a Waaagh! almost fifty thousand strong into the land between the rivers, slaughtering all he came across and setting what he could alight. Only after three weeks of smoke, fire, confusion and sacrifice, and the eleventh-hour arrival of the Knights of the Last Flower on the field, was the Mad Dok foiled at last. Part of the blood-cost paid included most of the leadership of both families, leaving each in new, inexperienced hands. For a time it looked like these would retreat to their fastnesses, to plot and plan the resumption of the war between them- until the Grandmaster of the Last Flower came forth. He scolded the survivors for their lack of empathy towards one another, for their willingness to see the rest of their families and their lands destroyed for the sake of an ancient grudge. It was, he hinted, exactly this sort of infighting that had brought about the fall of the Green Horse so many years ago. He would not stand to see it again. With his guidance a union was arranged between the de facto leaders of both families, overseen by the Knights. No longer would there be two factions between the rivers- forevermore it would be Reike-Woerlitz together. 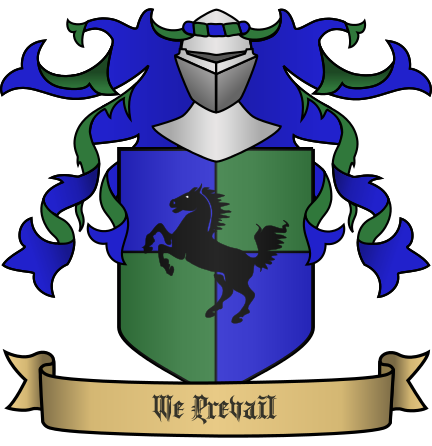 The ancient heraldry of House Reike-Woerlitz is the Horse and Rivers, and its motto is "We Prevail."